Descubra as delícias do Condado de Kerry, na Irlanda, nesta viagem de um dia de aventuras a partir de Dublin. Viaje por estradas costeiras sinuosas até o Parque Nacional de Killarney com o seu guia e explore belas cidades e aldeias como Adare, Aghadoe e Killarney. Maravilhe-se com atrações naturais, incluindo os lagos de Killarney, Black Valley e Torc Waterfall, e obtenha informações sobre a rica geologia da Irlanda. Pegue o Wild Atlantic Way pela Dingle Peninsula até Inch Beach e admire a Dingle Bay e a Tralee Bay antes de retornar a Dublin. This was just ok, the tour was larger than expected about 35 people and 9 more joined on the way back, the bus was very crowded. There was a lot of time spent on the bus travelling, I wouldnt book a trip with that much bus time again, it was pretty uncomfortable. Although the bus driver was entertaining enough the experience was a bit generic. The bus driver from Portugal was unexpected and not really appreciated I was hoping for a full Irish experience. The horse drawn carriage through the park in Killarney was the best part! Overall, I wouldnt recommend this tour. Meeting place was on one street but bus was actually located a block over. Dublin downtown streets are so torn up by construction there are no street signs and getting around driving is a real challenge. We took a taxi about 3/4 mile and was over ten euros just to get there. This is a good way of seeing the west of Ireland if you have a limited amount of time in Dublin. Fantastic views near Kilkenny, and especially, of the Dingle Peninsula and Inch Beach. The only negative was the relatively small bus, which became somewhat uncomfortable at the end of 14 hours. Overall, a good value for the cost of the trip. This was a fantastic trip. 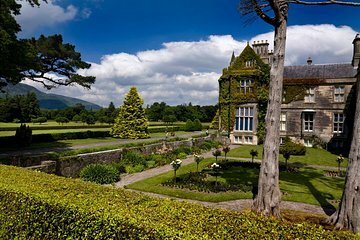 While much of the west and north of Ireland is rocky and windswept, County Kerry is a beautiful, lush place with wonderful forests, charming towns, and stately manors. This is where you'd want to live if you moved to Ireland. Our first main stop was at Killarney National Park before that we stopped at a rest stop for breakfast, where I had a delicious scone and a pot of tea, where we saw a waterfall and got to explore the forest paths a bit. Then we went to this old manor by a beautiful lake with many gardens and lawns to stroll through. Next was the city of Killarney itself, which was extremely charming, and had many restaurants for lunch, shops for souvenirs, and ice cream places for dessert. After that, we stopped at a very old church, a spot with a great view, and a large beach. It was extremely bizarre to see the Irish in wetsuits on a rainy 50 degree Fahrenheit day surfing, which was fun. Overall, fantastic trip, and the drive in the bus itself was beautiful with great commentary. I'm glad I booked it! This tour was a mixed bag--it's a very long day, with several nice stops. We got pretty soaked and clouds obscured the best views, but that's to be expected in Ireland. Unfortunately, our driver/guide got more and more annoying as the day went on and this really colored our experience. Insgesamt war gut, aber i.V. m. meinen 2 anderen gebuchten Tour gab es nicht viel Highlight, aber zeitlich war entspannend, hat man auch genügende Zeit zum Mittag zu gehen. A great and fun trip. Michael, the driver/guide was informative and entertaining. Don't miss it. Such a great day and tour! Overall, the experience was ok. It rained most of the time, which, is to be expected this time in Ireland, but overall, it was just ok. The guides weren't knowledgable and didn't make the trip worth while-- they were actually pretty boring. You spent a long time on the bus, and makes for a really long day.